St-Kitts and neighbouring island Nevis appear out of the clouds as if a remnant of paradise lost. On the approach to the runway, the plane circles around the island and one can get a glimpse of island life below. This “international” airport is really just a long strip that can just accommodate a larger jet such as a 737. After landing, one disembarks right onto the tarmac and is greeted by a welcome blast of heat and sunshine as they walk to the passenger terminal. Going through immigration and customs was a very straightforward process, but the customs agent insists that they know where you’re staying. I travelled to St-Kitts to meet up with my girlfriend who’s there on business, and after a long plane right and overlay in Miami with only a couple of hours of sleep, I honestly couldn’t remember the hotel where she was staying at. After a few questions and a lookup in the computer database, the agent confirmed everything and let me through. My first day in St-Kitts was an introduction to the island; the taxi driver gave me an overview of the sugar cane fields, talked a bit about the history of the island and then dropped me off at my destination. The people here have a laid back and sunny disposition. The place is very Caribbean, with the hot sun, palm trees, birds, fruit, flowers, and yes, even monkeys. On my first day, I unwound, napped a bit, had dinner and went to sleep early. 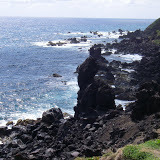 The next day, I headed over to Basseterre with our friendly driver Everton. My girlfriend headed to her place of work and I went to explore the city. It was a non-cruise day so there wasn’t a lot of activity within the city itself. I ran into a guy who helped me get to a convenience store where they were selling sim cards (which unfortunately didn’t work), where he got a cup of ice from the girl that worked there. An older guy then yelled at her for that since that guy just “limed” all the time (that’s how they call partying over here). I then explored some more of Basseterre and walked around the streets, saw a couple of churches, passed by Independence park, walked some more, ended up back on the park where I was greeted by “Evangelist Penn”. This man had just coughed up some money from some other tourists then almost ran toward me. I ended up giving him some money to supposedly help out mentally handicapped children; I don’t know if it really will or not so maybe I made a mistake there, but the guy did also show me around town and showed me around the government headquarters. He was even coaching street merchants on how to improve their sales skills. The rest of that day I spent back chilling on the beach, then headed over to the Mariott to play some Blackjack at the casino. The Mariott is a large resort not too far from where we’re staying and is really an all-inclusive experience for a family, though it is likely very expensive. The next day I went ziplining across a valley around an old sugar plantation that was powered by power, but now is run down and ruined. The views from this are really amazing, and our tour guide “Dr. Dre” had a lot of entertaining and insightful stories to share with us, some amusing such as the tattoo plant, and some which reveal the depth of the slave trade in St-Kitts with the use of the “Shy Lady” to track slaves and a thorn tree to punish them. I would recommend this trip as much for the views and the stories as for the actual zipline adventure itself, which was also a blast. Our driver also had interesting stories to share, and gave us some background into the meaning of the St-Kitts flag: The green is for the fertility of the land, yellow for the bountiful sunshine, black for the people’s African roots, red for the struggle for liberation, and the two stars signify hope and liberty. Lobster on a strip at night was a delightful treat, and then on to the next day. Today I went scuba diving for the first time in my life. It was a nice experience, but breathing from a tank took some getting used to. Once I adjusted to that, the next difficult part for me was descending. I had trouble equalizing the pressure in my ears no matter how hard I blew with my nostrils and mouth shut closed. I eventually got there, but it took forever to reach a depth of 30-40 feet. Once I got there I had less trouble and the view was amazing. All around us fish swam about, some gobbling like crazy at points here and there along the sea floor. A small stingray had floated by earlier, and nearby there was a boat wreck filled with all sorts of sea life. One of the most interesting parts of diving is the 3d mobility; it really gives a new sense of freedom to moving around. Our instructor found a sea cucumber for us to “pet”, which was interesting, and we also explored the wreck and held a barnacle that was in the shape of a spiky ball. Eventually our air started to run low which meant it was time to head back up. It didn’t feel like it, but we had been down there for a good 40 minutes or so. Various scenes around the island, including the plantations, Brimstone Fortress, ATV riding, zip lining, Basseterre, and Nevis. Happy St-Valentine’s and Happy New Year!